In their recent Nature Communications paper, Charlie Paull and his coauthors suggest that turbidity flows start when the seafloor becomes unstable due to underwater landslides or other processes (Stage 1 in the diagram above). The researchers note that sand on the floor of the canyon is often very loosely packed and water saturated. Vibrations such as those caused by waves, earthquakes, or underwater landslides could cause these sediments to “liquefy,” turning the seafloor into a water-saturated slurry. Note: Most of the turbidity events measured during the Coordinated Canyon Experiment occurred during the winter months, when storm waves deliver large amounts of sand to the head of Monterey Canyon. When this sand builds up on the edge of the canyon, it can occasionally trigger underwater landslides, which in turn might trigger turbidity events. Regardless of how the sediment initially becomes liquefied, the researchers suggest that the process creates a dense layer of water-saturated sediment that flows rapidly down the canyon and remobilizes the upper few meters of the preexisting seafloor (Stage 2 in the diagram above). As this dense slurry of liquefied sediment moves down the canyon, it mixes with the overlying seawater to create a diffuse, turbulent plume of fine sediment that may be hundreds of meters thick (Stage 3 in the diagram above; details in illustration below). This diffuse plume moves fastest near the seafloor, and becomes slower and more diffuse higher up in the water column. 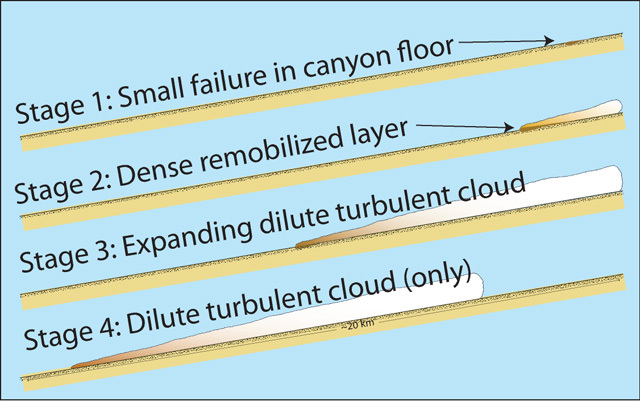 The dilute plume may continue flowing down the canyon even after the dense sediment layer in the seafloor has stopped moving (Stage 4 in the diagram above). The result is that many turbidity events that begin with the movement of water-saturated sediment end up in deeper water as plumes of turbid water. Previous studies and tank modeling have difficulty replicating the dense sediment layers described by Paull and his coauthors. But the new paper shows that this dense sediment layer is actually the most important (and potentially damaging) part of the observed turbidity flows, and that the diffuse plume above it is in some ways a secondary phenomenon.